The kit I’m using is my Carrera custom ‘Sound’ kit with an 18×14″ bass drum and 10×6″ and 14×10″ toms; it’s perfect for touring, as it’s small and lightweight (which helps in reducing the strain on the stalwart Ultra ’90s van which has to carry to the entire rig from place to place!) thanks to the thin birch shells, but the toms still have good projection despite their shallow depth. The toms are also close mic’ed with Sennheiser E604 drum mics. The bass drum is fitted with a mesh head, and all the bass drum sounds are triggered with a Roland RT-10K, going into an Alesis DM5 module. I’m using two snare drums here – my 14×5.5″ steambent maple Carrera Tunkan Ingan prototype is my main snare, but I also have a 12×5″ Mapex hammered steel snare as an auxiliary snare. This drum is tuned up very high and snappy, and it also has a Roland BT-1 trigger bar on the rim; this triggers a massive dance music clap sound from my Roland SPD-S. There’s often little variation in dance music drumming, so all the contrast and interest in the parts comes from adding and taking away layers of sound; playing a rimshot on the auxiliary snare means I can layer an electronic clap with an acoustic snare sound with one hand, and still be free to play the hihats or the ride cymbal with my other hand, so I can switch to this from my main snare going into a chorus or anywhere where the track feels like it needs to ‘lift’. Both snares are mic’ed with Shure Beta 57s. 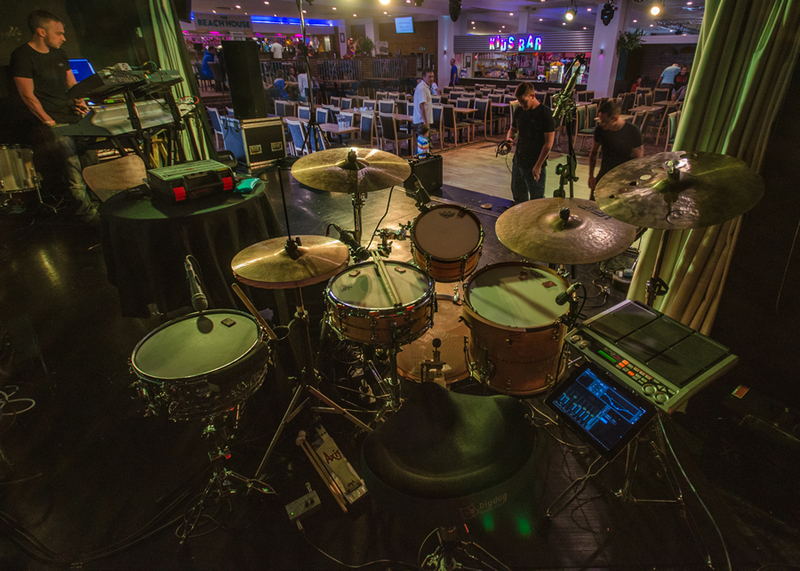 The SPD-S itself (on the right, next to the floor tom) I use to trigger various samples – as well as the electronic snare and clap sounds, I have rising sweeps and bass sub drops to use when appropriate in the music. Also on the same stand is my iPad, which is running Presonus UC Surface – a remote control app which communicates with the mixing desk for the show via a closed local WiFi network. The whole show is run to a click track, so being able to have full control over my own foldback mix for my in-ear monitors directly from the iPad is fantastic! I use ACS T3 in-ear monitors; playing sets of (sometimes) up to two hours without breaks, I really appreciate the T3s’ clarity of sound, and the comfort in my ears. The hihats are 14″ Paiste 2002 Sound Edge hihats, which are great for this type of gig as they are bright and cutting with a lot of definition. The main (left) crash is a 17″ Paiste Signature full crash – it has a bright, glassy crash sound which really cuts through the mix (even with all those layers of synths! ), but it’s also great for sensitive washes on quieter sections and build-ups. The ride is a very new acquisition, but one I’m really liking – a 20″ UFIP Bionic ride, with lots of stick definition without being too ‘gongy’ and overpowering. The second (right) crash is rather an interesting one; starting out life as an 18″ Dream Contact crash/ride, it has been modified and repaired by the very talented Benjamin Camp at CymbalMagic into an explosive, trashy ‘effects’ crash with dark and complex tones – it’s great for accents, and introducing a bit of contrast into the sound of the show. All the cymbals are nicely picked up by the overhead mic, which is an SE Electronics SE4a. On this show, I also use Pellwood Rock Classic Short sticks and Axis X-series pedals – both of which feel just right, and are comfortable for playing for long periods with no breaks, without getting tired. The Ultra ’90s gigs are always really fun, and touring with these guys is something to which I really look forward; having the right gear to take on the road makes sure I can always do my job to the best of my ability, and put on a good show for the crowds every night.